Recently, I wrote about how the Iranian military was using children as young as eight-years-old to deploy into Iraq and Syria, and fight the barbarians in the Islamic State of Iraq and Al Sham (a.k.a. ISIS). I argued that such a move was endemic of a regime that routinely brutalizes its most vulnerable people; that whether one is young, a woman, or simply someone who disagrees with being ruled by a totalitarian theocracy, the government of Iran will threaten, torture, and/or kill you at some point. For too long, the good people of Iran–particularly the youth–have been stepped on like ants by their “religious” elders. Now, it would seem, that the Iranian youth are stepping out again and giving freedom one more chance. Back in 2009, a similar wave of youthful protest began. 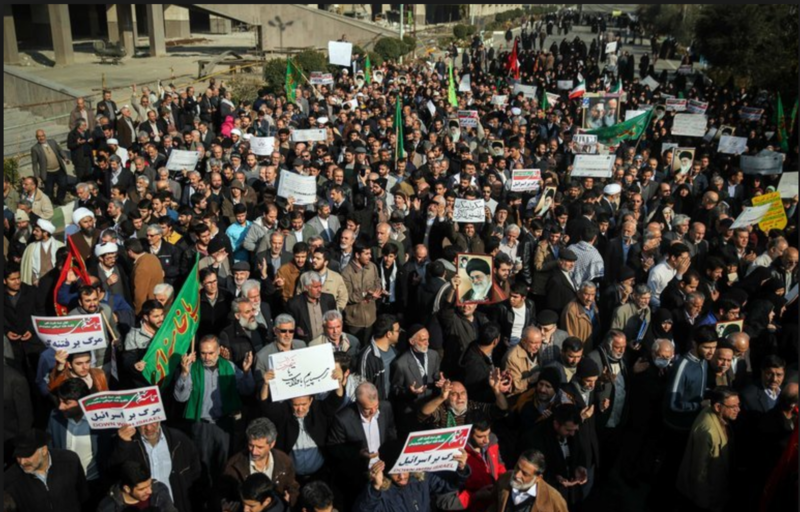 Just as with the current spate of protests ripping the country apart, the protest back then began over the stench of unbridled corruption within the Iranian political system as well as the tainted election of 2009. Like that protest, what began as a limited (albeit angry) protest devolved quickly into a national uprising against the very idea of an Islamic republic (you see, the concept that a democratic form of government could occur in Iran was not in question, what was being challenged was that such a government existed in the first place there. After all, the Mullah council–a group of unelected religious jurists–along with the Ayatollah ultimately determined who would lead Iran, not the voters). Incensed at the blatant corruption of the election process, the youth protested. From there, the Iranian security services went into full swing and began their vile work of suppressing their own people–murdering, arresting, and tormenting anyone who even whiffed of rebellion. For the youth of Iran, their only real hope resided in the West. They desperately looked toward the countries that had only six years earlier claimed to be invading Iran’s wayward neighbor of Iraq to spread democracy to the Mideast. Of course, no one wanted to see U.S. Marines moving in from Baghdad into Tehran, but what the youthful protesters desired in Iran was an acknowledgement of their struggle; they wanted to know that the advanced societies of the West recognized their plight and stood with them–and, when possible, proffered aid, no matter how small or indirect. More importantly, the young protesters looked to the figure who had become the president of the United States in 2009: Barack Hussein Obama. The protesters in Iran in 2009 were riding a wave of international hope and change. Gone were the neoconservative fantasies of the George W. Bush Administration (or so Mr. Obama and the Democrats who control Washington, D.C. claimed). Democracy would not be spread by the sword; instead democracy would grow and mature, thanks to the example that the United States set for the world. But, as the protests raged in Iran in 2009, and the young people were slaughtered in the streets, the former Obama Administration was mute on the matter. In fact, reports have surfaced indicating that former President Obama was desperate to reach out to the embattled Iranian leadership and assure them that the United States had a) nothing to do with the protests and b) would not involve itself in any way, whether through rhetoric or military action. All of this was in an effort to curry favor with the terribly aging Mullahs of Iran, so that Mr. Obama could achieve his nuclear agreement with Iran–what Trita Parsi, a brilliant apologist for the former president, dubbed Obama’s greatest foreign policy achievement. Back in 2009, America’s first African-American president–a man who had himself spent some years as a child in Muslim Indonesia, as well as having spent time visiting Pakistan in his college years–would have been the perfect figure to fly to the Iran-Iraq border, don a green tie (the color of Islam), and profess his solidarity with the young people of Iran (or, his successor would prove, a simple tweet would suffice as well). But, this was not to be. In fact, while Obama spent 2009 verbally sniping at Sunni Arab allies, like Egypt (his infamous Cairo speech is thought to have been a leading motivator behind the disastrous Arab Spring), or bowing before the former King of Saudi Arabia, he all but ignored the strategic opportunity that presented itself in the streets of Iran’s greatest cities. As the young people of Iran were protesting and being suppressed by their government’s so-called “security” services, another group of Iranian dissidents sat in the safety of American care in neighboring Iraq. The Mujahideen-e-Khalq (MEK) was founded in 1965 as a Marxist revolutionary movement opposed to the rule of the Shāh of Iran. When the Grand Ayatollah Khomeini returned to Iran from his exile in Paris and led the Islamic Revolution in Iran that ultimately toppled the Shāh’s government, the MEK supported the Grand Ayatollah. But, when the Grand Ayatollah refused to allow the MEK’s leader, Massoud Rajavi, to run for the presidency of Iran, the MEK rebelled, and have been staunch opponents of the regime ever since the 1980s. This group fled into neighboring Iraq when Saddam Hussein ruled there, and allowed themselves to be used by Saddam’s regime as a paramilitary outfit during the Iran-Iraq War of the 1980s. The goal of the MEK then, as it is now, was regime change in Tehran at all costs. The MEK, by the way, is the group that brought the United States the initial intelligence on Iran’s nuclear weapons program. Without the sacrifices of the MEK, the United States would likely have been in the dark about Iranian capabilities and intentions far longer than they were. When the United States invaded Iraq in 2003, the United States Army forcibly disarmed the MEK. Yet, as disgraced former Undersecretary of Defense for Policy, Douglas Feith, wrote in his 2008 magnum opus, the MEK was disarmed as per a secret agreement with the Iranians and the George W. Bush Administration. Now, the MEK is a small group that has a very small following in Iran. But, the fact remains that they are a strategic lever that the United States never fully utilized to complicate Iran’s grand designs for the region. Point in fact, the United States was always uneasy about the MEK because they were responsible for the killing of a dozen Americans during the Shāh’s reign in the 1970s. As noted, they also supported the Grand Ayatollah’s initial “revolution” in 1979. Although, that soon changed when it was discovered that the Grand Ayatollah and his followers were not the democrats they claimed to be. In order to prevent direct Iranian meddling in the ill-fated U.S. invasion of Iraq, according to Feith, President George W. Bush granted assurances to the Iranian regime. Part of the secret agreement made with Tehran involved the listing of the MEK as a terrorist organization; several MEK bases on the Iraq side of the Iran-Iraq border were bombed by Coalition airstrikes in the opening of the Iraq War in 2003; and the U.S. never fully embraced the MEK on a covert level that we otherwise would have. Despite upholding the agreement, the Mullahs in Iran were not cowed by former President Bush’s good will. And, in fact, the Coalition airstrikes and the disarmament campaign that the U.S. Army enforced on the MEK actually harmed American strategic interests in the long-term. After all, by 2004, we know for a fact that Iranian Qods forces and intelligence operatives were working with impunity to support the various terror groups fighting the Americans in Iraq. From roadside improvised explosive devices (IED) to funneling money and weapons to providing sanctuary for not only the Shiite militias in southern Iraq, but also al Qaeda in Iraq and other Islamist groups fighting in Iraq, the Iranian regime had no compunction about reneging on their initial 2002-03 deal with the former Bush Administration. When the Green Revolution broke out in Iran in 2009, the former Obama Administration could have–should have–armed the MEK guerillas and sent them into Iran. Despite numbering only a few thousand members, this force could have become an effective external force placing pressure on the already-strained Islamic Republic of Iran. While neither the protesters nor the arming of groups, like the MEK, would have broken the back of the regime in 2009, combined these elements could very well have proven to be the perfect storm, as it were, that would have toppled the Islamic Republic and allowed for a true democratic society to arise in Iran. Today, the Trump Administration should look to the remnants of the MEK who are itching to return to their homeland, and covertly support this group. Of course, this group has a shady history and it remains to be seen whether they actually have the support of the Iranian people (this is unlikely, since they’ve been out of the country for three decades and have actually spent that time killing Iranians). But, arming such a group and deploying them into Iran at a time when the country is already under siege by a popular revolt might just be the perfect amount of chaos needed to sap the strength of the tyrants in Tehran, and give the young people of Iran a chance to take their country back from the mad Mullahs. And what about this current protest? Iran currently does not have this. At present, Iran’s fertility rate (according to data from the year 2015 located at the World Bank), was a measly 1.68 children per women. According to demographers, a country needs to have a baseline fertility rate of 2.1 children per women to maintain what’s known as societal replacement. Without those basic numbers being met, over time, a country will decline; its economy will stagnate; and its political stability will be lost. All of these factors are in play in Iran today. It’s quite telling that the old, stodgy religious leaders of the country are the ones who are pushing the most aggressive Iranian foreign policies. They, not the majority of the young people, are obsessed with nuclear weapons. The Mullahs and their minions in Iran’s parliament are the ones most interested in annihilating Israel (which has a fertility rate of 3.05 children per women, by the way). It is the aging and brittle Mullah council–and the equally elderly Ayatollah Khamenei–who insists on a close alliance with both Russia and China (when the youth would prefer to have open relations with all, but most especially with the West). Culturally, the youth of Iran are highly Westernized. Politically, they are mostly moderate and trend toward real democracy. This is now the second attempt in 8 years by Iran’s youth to overthrow a decrepit and apocalyptic regime in Iran that has no compunction about killing and abusing its own people–most especially its women and children (the sources of life for any civilization). Time is not on the current regime’s side, since they are old and will die off (and those younger people who support the regime are in the minority). Whether the current protest manages to overthrow the regime is a question neither I–nor anyone else (despite what the professional pundit class will tell you)–is qualified to say with certainty. But, even if this protest goes the way of the Green Revolution in 2009, the young people protesting will not simply go quietly into that good night. One way or another, they will rise to power eventually and takeover the government. The Iranian regime will fundamentally change in the next 20 years, if left to its own devices. Yet, the current elderly, radical leaders of the Iranian regime understands this fact. The Mullahs, as I’ve written before, are cognizant that time to realize their radical, millennarian vision of a Shiite utopia on Earth is running out. Such realization makes Iran’s current government more dangerous, not less. For now is but the only time that the current regime has to potentially move the needle of history in their direction. Thus, the protesters will need help. Don’t listen to a soul that claims that President Trump’s recognition of Israel or his decertification of the idiotic Obama Administration nuclear deal with Iran did harm to American interests. On the contrary. I fully believe that these actions sent a signal to the Islamic world, Sunni and Shiite alike, that the United States was not going anywhere and that America would protect its friends and punish its enemies. The move signaled to a region obsessed with following “the strong horse” that the United States retained its dominant position. Plus, the bold moves of the Trump Administration prompted the long-time Iranian benefactor of Russia to either put-up-or-shut-up on the issue of which “side” they supported in the budding Sunni-Shia Civil War. Not only did Russia officially recognize Jerusalem as the capital of Israel, but they also apparently sold Israel the codes that would allow the Israel Defense Force (IDF) to compromise the advanced, Russian-built S-300 air defense systems that Iran recently purchased. The move, if true (and I fully believe it is, given my knowledge of Russia and how they love balance-of-power politics) indicates that Russia is not as beholden to Iran as Western intelligence services in the United States and Europe insist. Russia will gladly do business with Iran and use them as needed, but ultimately, the Russians are disinterested in being wedded to an old and dying regime in Iran–especially if it is about to be overthrown in a popular, youthful uprising. It is likely that Russia is doing these things also because of the strength that Trump Administration has exhibited in its Mideast policies. The Russian-build S-300 is the most advanced air defense system (as well as the Russian S-400) in existence (or so it is claimed). It is purported that the S-300 can track and destroy advanced, fifth-generation warfighters, such as the F-35 Joint Strike Fighter, rendering the country deploying these systems virtually impregnable and therefore mostly secured from Western military technology. Russia undermined themselves when they sold the weapon system to the Iranians but then gave the Israelis the tools they would need to defeat those systems. All of these things work against the Iranian regime. Throwing in the MEK to admixture just might prompt the kind of overreaction on the part of the Iranian security services that would be needed to galvanize the majority of the Iranian population into actually effectively overthrowing the current regime. Very little effort is needed on America’s part, other than the will to act in defense of its interests. Unlike the former Obama Administration which woefully miscalculated the situation in Iran in 2009, the current administration seems intent to keep its proverbial eye on the prize: prevent Iran from going fully nuclear; rollback Iran’s strategic gains in the region over the last 17 years; and bring about regime change–without committing American forces to doing so. History rarely presents a great power second chances. But, when it does deem to afford a second chance, it takes a bold leader to reach up and take it. The young people of Iran will do the heavy lifting. They just need our support. That involves not only complicating Iranian ambitions on the world stage; enforcing sanctions protocols against Iran; raising the threat of the MEK to the regime; but also using public diplomacy to empower the young people. The Iranian regime has cut off access to the internet and popular social networking applications. The United States should move in and overcome the Iranian security measures. Beam in pro-youth democratic messages. Let the young people know that the Free World is with them fully. Do not reach out to the Mullahs as President Obama inexplicably did. They are not legitimate. Only the young people fighting for their country are. The young people of Iran have finally struck back at their elderly oppressors. The Trump Administration must seize this opportunity to remove an existential threat without resorting to force of American arms. History is on the side of freedom–so long as free people choose to act in defense of freedom everywhere. The next generation of Iran is making their stand now. The people of the West should support them. Previous Is Europe Experiencing Immigration–or an Invasion?